The music industry has changed, and it continues to shift. The traditional music industry was built on the world of physical shelf space, 12” pieces of vinyl, 5” circular pieces of plastic, the increasingly-irrelevant MTV, AM/FM radio, and analog television. All are gone or near gone, and so is the old world. The traditional music industry was not built for the world of digital downloads, on-demand streams, and unlimited digital shelf space where everything (and everyone) can be available with unlimited inventory on demand. The days of the major labels are over. 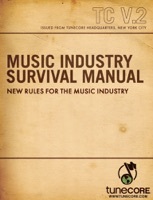 The “New Rules For The Music Industry” in this book originated as a TuneCore blog post, and we think these rules should last longer than the 80-year-or-so run of the traditional music industry. The rules in this book are accompanied by supporting articles, and are of value to those who will control the new music industry: the artist and the songwriter. You can read, comment and contribute to the conversation at the TuneCore blog. Written by Jeff Price, TuneCore Founder/CEO, and George Howard, former president of Rykodisc and current advisor of numerous entertainment and non-entertainment firms and individuals. Edited by Jacqueline Rosokoff and George Howard.